Kutluğ Ataman has got into the spirit of the Brighton Festival with a carnivalesque metaphor for the recent turmoil in the Arab world: a waterfall which defies gravity. But the relative safety of an art space in the West, gives us some distance from this drama. Like a television with the sound down, Ataman’s film cools off the spectacle of unrest. Indeed water is used often in Islamic architecture for this very purpose: to keep occupants cool. Three of the channels are projected onto the floor like pools in a mosque. In a visual sense, this is a monumental feat of plumbing. The work offers a strong contrast with the vast disused space of the Old Municipal Market and its dusty concrete floors. And at the risk of wearing out his name, Duchamp did once say that plumbing was the difference between sculpture and architecture. His fountain and Ataman’s both play with that distinction. 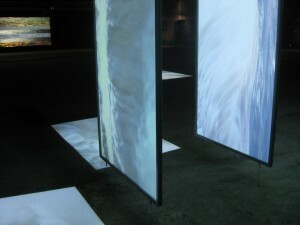 But only a sculptural film installation could harness the power of the Iguazu Falls. This wild South American region is also called Mesopotamia. But which one is the newer world? The Old Municipal Market is on Circus Street, Brighton, and the show runs until 29 May 2011. It’s organised by Lighthouse. See their website for more details.